I’ve just eclipsed the one year mark since I had one of the most magical experiences in the most iconic city in the world. I have always dreamed about exploring the big apple and the only time I had previously been was a 5 minute photo stop at Times Square in transit after a wedding in New Hampshire on the way to JFK. This time around I had 9 days to dig in and I prepped myself to hit those streets hard. Everything about this city felt enchanting to me as I explored the endless bounty that this iconic mecca offers. From the live music/comedy venues, the coffee, the food, the immensely talented street performers, the insane architecture of the endless skyline, all the way to what I would say is possibly the most impressive feature of this city: The New York subway system. It connects everyone to everywhere and it does so more directly and more affordably than any city i’ve ever been to. Sure it’s grimy and dirty and you never know what’s going to happen to you, but that’s part of the whole adventure for visitors and residents alike. Out of all the epic things I could check off my own bucket list while I was in NYC, going to a taping of the Tonight Show with Jimmy Fallon was way, way up on the list for me. My second day in the city I started putting the feelers out on social media if I knew anyone with connections to get tickets. Responses began trickling through and I got a lot of maybe’s and even one or two people who got really close to actually hooking it up. After a few days of the net being cast without any results though, it appeared that it might just be a pipe dream for that week. As I was nearly about to resign from the notion of being able to go, I decided to go to the Tonight Show website to get more info ( Left brained people are baffled that this was the LAST thing I did, not first!). The moment I opened their home page I was quickly overwhelmed with the biggest blast of motivation I could of possibly imagined to do whatever it took to get in. Right there on the front page of the site was billboarded that the following night my #1 favourite band/artist of all time, Bon Iver, was playing/premiering a brand new never been heard before track off their upcoming album! In that exact moment I became transfixed on the goal of sitting in that studio the following afternoon. I don't use the word transfixed lightly here either. I made a deliberate and conscious shift that I would become rabid, even unreasonable in my pursuit of sitting in that studio the next day. I remember saying to God : “It would be one of the coolest things to ever happen to me if this were to happen, let’s do it together!” Might seem silly to some, but it felt natural to not demand that God do something FOR me, but rather adventure WITH me towards this dream and plan that had materialised quite suddenly. As I continued scrolling through the Tonight Show website I learned that they offer a limited amount of standby tickets everyday for that days show. At 9 am they give out these standby tickets on a first come first serve basis. These tickets don't even guarantee you will get in, but allow you a spot if people with actual tickets are no shows on the day. 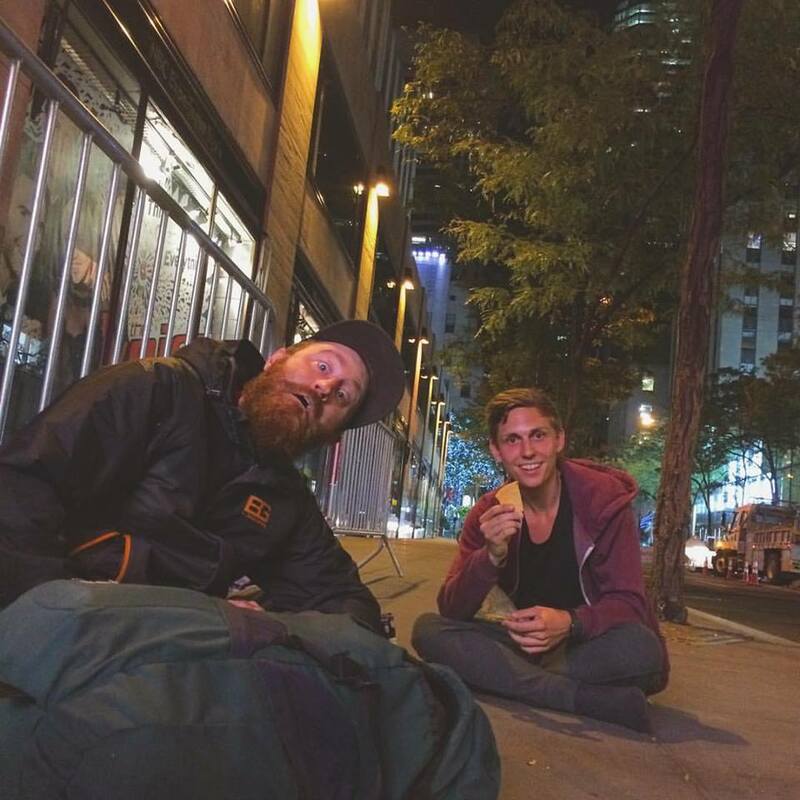 So… I did what any obsessed fan would do and decided I would camp out overnight in front of 30 Rockefeller center where the show is filmed. As I updated my social media accounts with the plan I saw a unusual amount of people respond with the feeling that they were quite connected and committed to the outcome of seeing me get in. I communicated my newest plan of posting up all night, and to my total surprise and delight one of my wildest and eclectic friends saw the plan and reached out to me. He just happened to be on a 18 hour layover through JFK on the way to Europe. He was arriving at 10 pm and had no place to sleep in the city that night and had planned to just sleep in the airport. He enthusiastically offered to come hang with me instead and we met at midnight underneath the Rainbow Room pavilion on W 49th Ave. to begin the 9 hour countdown. Talk about a friend! The dude wasn't even going to be able to attend the show because he would be going back to the airport before the taping that afternoon at 3 pm. He voluntarily laid out all night on the grimy streets of midtown Manhattan, chatting in between horrible little naps that were drowned out by the sound of incessant jackhammering happening 50 meters away, simply to hang out with me! At 4:30 am the first person joined us in the line. He was a delightful young man from Austria named Florian. It wasn’t until 7 am that other people started to join the queue and by 9 am there were about 50+ people waiting for the NBC page to emerge from 30 Rock and distribute these “golden tickets”. I was basically 7 hours earlier than most of the “normal” humans that wanted to take the gamble to see that nights episode live. But it allowed me the immense pleasure and privilege to hold the #1 ticket, the highest chance of success to have this dream become a reality. All recipients of the stand by tickets were instructed to return to the NBC retail store at 3:30 pm with the ticket they had received, to hear the update on the attendance of guaranteed ticket holders . The message was further reinforced that this was purely a hypothetical chance to get into the taping, and that the stand-by ticket was far from a guarantee and that NBC owed us NOTHING. They were adamant that this ticket was ONLY for the person whose name was taken down that morning, in correspondence to the number on that ticket. You weren’t allowed to give away or sell your ticket and even if you did it would be void if it didn’t match the govt. ID name that was on the list that they taken down that morning. I walked away from the line at 9:30 am brimming with hope coupled with the sobering thought of how i’d feel if I was given a verdict that left me outside this iconic tv studio. I wasn’t sure if I was prepared for that type of let down after all that i’d already been through. To pass the time, Jez and I ventured out for a morning of rich adventure. We discovered the best bagel in NYC and strolled through the United Nations plaza and finally said our goodbyes at the famous Penn Station. He got on a train back to JFK, on route to Lithuania while I was on route back to 30 Rock and my date with destiny. After a short nap in Central Park and a quick NY slice I ventured back to midtown to arrive at the NBC store as instructed, 3:30 pm sharp. The 50+ people who were also taking the risk to get some good news began to huddle in the corner of this retail/memorabilia shop. As we began getting lined up based on the # that was on our ticket I had a brief moment of triumph as I was escorted right to absolute very front of this group. It was a very comforting and familiar feeling to be standing right alongside my new Austrian friend Florian, the #2 ticket holder. We exchanged our excitement and nervousness for the next 15 minutes, batting back and forth the prediction of how it would feel if we get in, whilst sheepishly trying to push down the possible disappointment that would occur if we got turned away. "Ladies and gentleman, thank you for showing up on time with the stand by tickets you received this morning. We are so excited for today's episode and congratulations on getting to this point. We are just finalising a few more things before we can confirm whether we have any open seats for tonights taping. Please be patient for just a few more minutes." She slunk back behind the doors that would soon either swing wide with exuberant joy, or remain frigidly and brutally closed to myself and the despondent few gathered there. 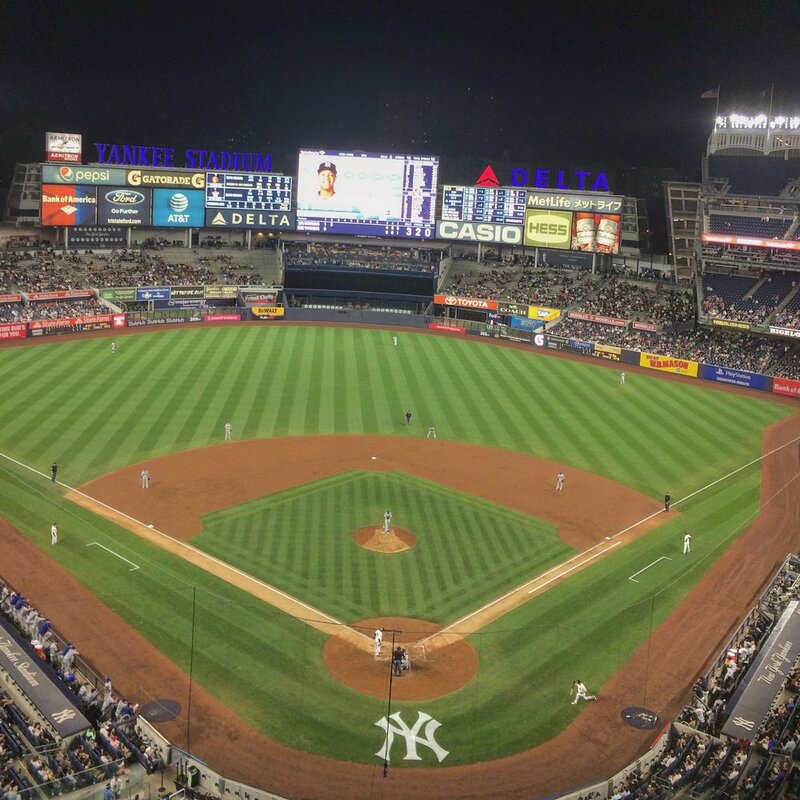 First game at Yankee Stadium. They lost. 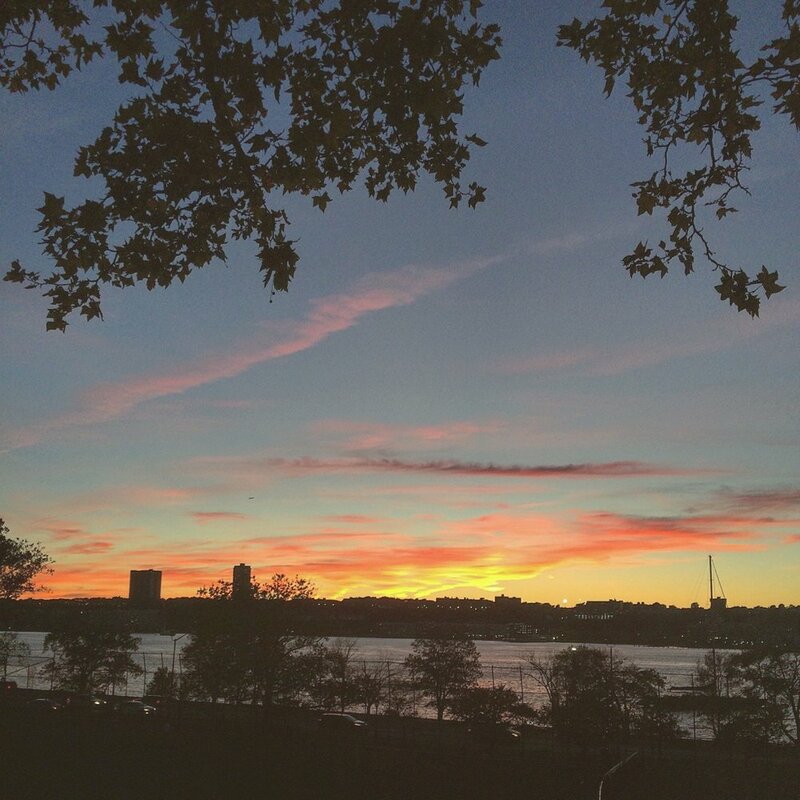 Sunsets over the Hudson River. I stayed a block away from here on the upper west side with some dear friends.